Pathogens and their hosts tend to co-evolve — not necessarily to a peaceful co-existence, though. Often it’s an arms race: Individuals that are resistant to the pathogen leave more offspring, and resistance spreads through the population; then pathogens that can infect the formerly-resistant hosts are selected and spread; and a new subset of the hosts begin to do better and their genes spread through the population. This back-and-forth seesawing is, of course, a multi-generation thing, and so it’s hard to watch it happening in real time. We’re more likely to see snapshots in time, where either the pathogen or the host has temporarily got the upper hand. In some cases we may be able to watch parts of it happen in motion. I’ve mentioned some examples earlier — Marek’s Disease in chickens, myxomavirus in Australian rabbits here and here — but even there we’re talking about many decades of evolution. The class I major histocompatibility complex (MHC class I) is heavily involved in resistance to viruses. MHC class I arose about 450 million years ago (Ah, how well I remember it) in the shark lineage, and it’s present in all vertebrates, though in many combinations and variations. The MHC region of the genome is also incredibly diverse (that is, individuals in a species are likely to have a different MHC sequence from other individuals); it’s by far the most variable region of the vertebrate genome, with some 1000 alleles identified in humans. In general it’s agreed that the underlying reason for MHC diversity is that the diversity helps with resistance to pathogens. The details of how pathogen resistance drives that diversity are debated, and I’ve talked about those reasons before (see here and its linked articles, also here and here and linked articles therein). But pretty much all the models agree that if a particular MHC allele is associated with increased resistance to a common pathogen, that allele should become more common in the population. It’s pretty hard to actually measure that in a real population, pathogens being uncooperative and populations being moving targets and all. So when we see, for example, that humans in malaria-prone regions are more likely to have one particular MHC class I allele that might give some protection against malaria,1 we can’t really be certain that the particular allele in that area has increased over time, or that malaria resistance has driven the hypothetical increase. Changes in MHC allele frequency might be driven by natural selection, but it would take a pretty terrible plague to cause easily detected changes over a short time. The UK ranavirus epidemic may be one such plague. 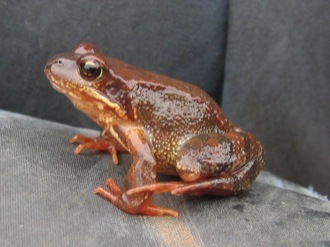 Teacher et al2 have looked at the MHC region of wild Common Frogs (Rana temporaria), and compared the alleles in a population of frogs in the thick of the ranavirus epidemic, to one not exposed. The ranavirus-selected frogs are much more likely to have a particular group of MHC class I alleles, suggesting that these frogs have been selected for resistance to the virus. One popular model for MHC diversity is frequency-dependent selection — a rare MHC allele happens to confer resistance to an important pathogen, individuals with that allele are selected, the allele becomes common, and then the pathogen adapts in turns — mutates so that the allele no longer confers protection — and a new rare allele is selected instead. I don’t know of any clear examples where each step in this model has been shown, probably because we can only see the snapshots, not the moving picture. Here’s an opportunity to see the whole story. We’re at a point where we almost have the technology to track the whole ranavirus genome over time. You may remember the foot-and-mouth disease outbreak a couple years ago, where researchers were able to sequence whole genomes from the FMD virus as it spread among farms, mutating as it went — we aren’t quite at the point where we can do that with ranavirus (it’s a member of the iridovirus family, which have much, much larger genomes than the FMD virus) but we’re close; storing virus snapshots captured over time will pay off in a few years. 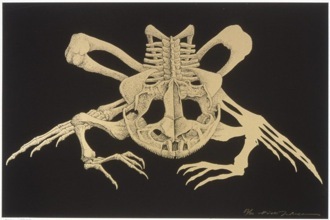 Some people may wonder if this frog virus story has any real relevance to humans. Well, apart from the pure scientific interest of tracking a potential frequency-dependent selection event in real time, one of the clearest links between an MHC class I allele and resistance to a viral infection is in humans, where the MHC class I alleles HLA-B27 and HLA-B57 are linked to resistance to HIV and HCV. Is it possible for HIV to adapt at the population level, so that the dominant strains of HIV in the world are no longer contained by HLA-B57? More generally, if we succeed in developing a T cell-based vaccine against HIV, it will probably have strong allele-dependent effects — will HIV adapt to this vaccine? I’ll talk more about that next week. This entry is filed under Evolution, MHC, Virology. You can follow any responses to this entry through the RSS 2.0 feed. Both comments and pings are currently closed. 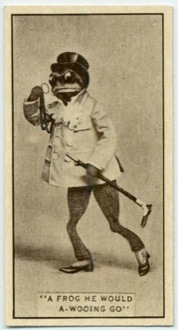 A frog he would a-wooing go… awesome. Just… awesome. The disease affects the skin of frogs and salamanders.The idea is that the fungus is a native thing that naturally occurs in these areas, and that some environmental trigger causes it to break out, going from some form that doesn’t infect or kill frogs. Speaking of pathogens, this is an agent of disease.